We can provide you with competitive pattern imprinted concrete quotations from a database of authorised paving installation companies around the UK. 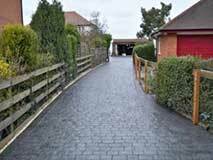 Whether you are looking to renew your driveway, footpath, playground or car park, this service is completely FREE. 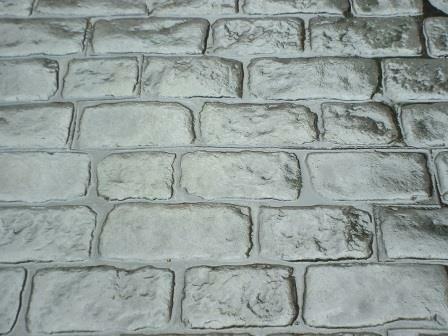 Complete the online form TODAY to save money on pattern imprinted concrete paving with Paving Prices. Pattern imprinted concrete replicates natural paving products such as stone, cobbles, slate, brick or even timber by colouring and forming high strength concrete. Often abbreviated to PIC, it is also known as stamped concrete, decorative concrete, pressed concrete or textured concrete. PIC can be used on domestic driveways and patios as well as in commercial settings such as pedestrian areas in shopping precincts, around fast food restaurants and at theme parks. In North America stamped concrete has been coloured and formed since the middle of the last century to create a more attractive surface for driveways, patios, footpaths and swimming pool surrounds. 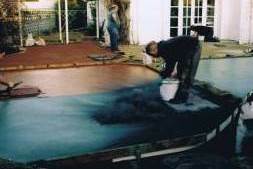 It is called stamped concrete because installers stamp on the printing mats to form shapes in semi-firm concrete. When introduced to the UK it was renamed pattern imprinted concrete. Specialist tools, skills and experience are required to create a realistic reproduction of natural paving products from concrete. Even professionals get it wrong sometimes and this can lead to extensive cracking and discolouration of the concrete surface. Pattern imprinted concrete will never look exactly like natural paving products but specialist contractors are able to get very close in terms of appearance, colour and texture. For every style of natural paving such as cobbles, setts, stone, slate, brick or timber boards there is a pattern imprinted concrete equivalent. And for each one of those there is a wide selection of layout patterns including herringbone, basket weave, stretcher bond and circles. 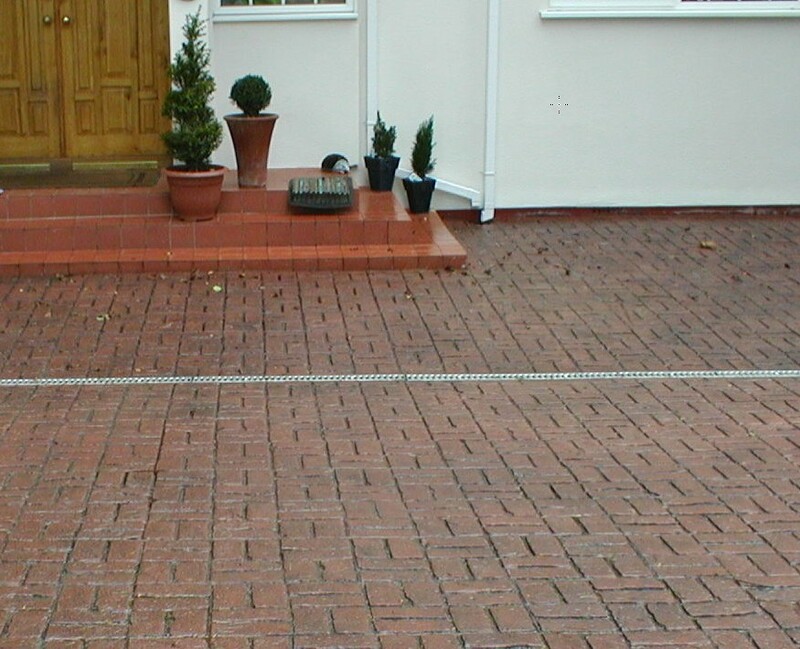 Most driveway designs benefit from two or more contrasting patterns and colours being used, together with borders or a central feature. The use of the area should be considered when choosing a pattern as some with smoother surfaces are more suited to pedestrian areas whilst others with deeper joints may be better for vehicles. The finished colour of a pattern imprinted concrete surface is achieved by using two colour pigment powders known as colour surface hardener and antique release agent. Although they both play a part in creating a realistic coloured paved effect, they have very different jobs in the installation process. Colour surface hardener is a mixture of pigment and cement, supplied as a powder mixture and, as they say, it does what it says on the can; both colouring and hardening the surface of the concrete. The more cement there is in concrete the harder it becomes and adding more cement to the surface improves its strength and durability. Colour surface hardener is scattered across the damp concrete and trowelled into it repeatedly until all of the surface water in the concrete has been soaked up and a uniform colour is achieved. A pattern imprinted concrete driveway wouldn’t look realistic if it had just the solid colour which colour surface hardener provides. 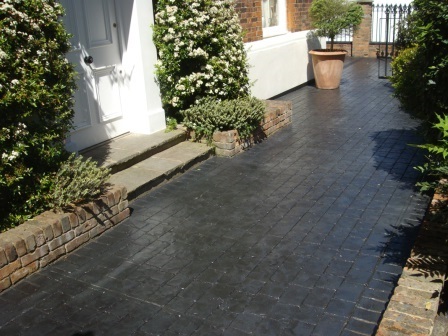 The contrasting pigmented colour of antique release agent powder creates colour differences across the surface of your new driveway to make it look more like natural paving. As with colour surface hardener, antique release agent also has two jobs. It enhances the finished colour of the imprinted concrete and also makes it easier to lift the printing mats from the surface of the newly pressed concrete without spoiling the pattern. Without antique release agent the suction effect of the printing mats on the concrete would spoil the pattern as they are lifted. Colour surface hardener is available in around 25 different colours and with 10 antique release agent colours they provide up to 250 colour combinations for pattern imprinted concrete. However, multi-blends of both colour surface hardener and antique release agent are often used which greatly increases the options possible. There are also as many as 30 different printing mat patterns available for different types of stone, cobble, slate, brick or timber board effects. 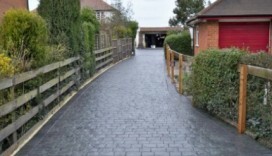 This means that there are thousands of different combinations of colour and pattern; and that’s before you even consider the shape of your new driveway. The installation of all paving products requires technical ability, experience and good judgement but none more so than the installation of pattern imprinted concrete. The average DIY enthusiast may be quite capable of installing a block paving driveway but only an experienced expert in pattern imprinted concrete is capable of creating a realistic interpretation of natural paving products using concrete. Judging how to take account of ground conditions, bad weather, a large site or a late concrete delivery are crucial in ensuring that the finished result is of good quality. However, whilst every pattern imprinted concrete installation is different there are a number of stages which are critical to every job. You should obtain several pattern imprinted concrete quotes, not only to get comparable prices but also to listen to different design ideas. All quotations should be in writing and set out exactly what is included. The initial survey should produce a scaled drawing including the position of planting areas, steps, drainage and how underground pipes and cables are to be dealt with. Your order form should include your choice of patterns and colours for the main area, the border and other features. It should also show the location and design of steps, drainage systems, planting areas, contraction joints and any additional work such as boundary or retaining walls and tree removal. The order form should show the full price including V.A.T. 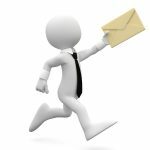 for the work, a schedule of payments and agreed start and finish dates, allowing for bad weather and previous job over-runs. Prior to site preparation the foreman should confirm all details of the project with you, arrange for any prized shrubs to be removed and where skips can be placed. If pattern imprinted concrete is to be installed on your front driveway, access to your home during the works should be arranged and how this may involve or affect neighbours. 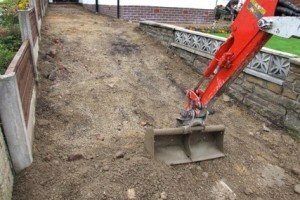 On an average driveway up to 25 tons of spoil may be removed using a mechanical digger, although for a rear patio area excavation is normally by hand. Either way, for an average installation, ground excavation and preparing the correct falls for drainage would normally be completed in one day. 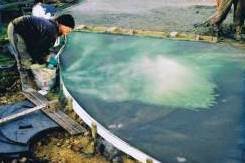 When should a slip membrane be used? – Installing a slip membrane between the sub-base and concrete can allow the concrete to move independently of the sub-base, which makes it less likely to crack. It also slows down water seepage from the concrete to the stone below which means that the concrete will set more slowly and give the installer more time to produce a better finish, especially on hot days. However, if the concrete is too wet, a slip membrane will hold water in the concrete and make it difficult to produce an acceptable print in the wet concrete. Either way, this is one example of where the installer is making a judgement on the day. Unless retaining walls are to be constructed and some areas are raised, the position and type of drainage is determined by the natural contours of the land. Gullies and drainage channels are installed at low points to divert surface water to soakaways. And all gullies, drainage channels and recessed manhole covers should held in place with concrete to stop them moving. Linear drains known as aco drains should be installed across the driveway at the bottom of the slope, whether that is in front of your garage or at the entrance to your driveway. Surface water collected by aco drains should be diverted to a soakaway. Unless surface rainwater from a new non-permeable front driveway is absorbed into the ground within the grounds of the property, planning permission will be required. This is to force homeowners installing a non-permeable paving surface to install appropriate drainage systems including soakaways or rain gardens. Surface water cannot be allowed to drain onto the public highway or straight into gullies which divert water to underground drainage. The intention is to slow down the movement of rainwater into drainage systems which otherwise may not cope with the volume of water during heavy rain. Sustainable Urban Drainage Systems (SUDS) were made mandatory by the The Flood Water Management Act 2010 which introduced legislation to address water quality and scarcity, water flow and the threat of flooding. For householders installing new paving it extends the responsibility of dealing with surface water responsibly, to all parts of the property not just the front driveway and garden. Formwork, or shuttering creates a shape for the concrete to be formed within and it normally consists of 100 mm wooden planks held in place by steel pegs. If your new pattern imprinted concrete driveway has curved borders, the shape of these can be created by using flexible 10 mm thick PVCu boards. For very large areas, shuttering will also be required at a day joint which marks the extent of concrete which can be laid within one day. It is important that you check the position of the formwork to ensure that the shape and size of your new driveway is as you anticipated it. 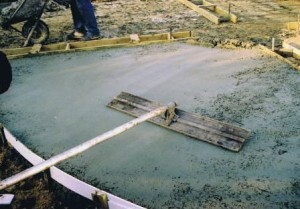 The top edge of the shuttering is set at the proposed finished level of the driveway and is used to tamp the concrete surface. To protect the leading edge of the concrete at the entrance to the driveway, concrete edging, cobbles or stone setts should be concreted into position before concrete for the driveway is poured. This will also create a protective dividing line should the local authority carry out work on the pavement beyond your driveway. Prior to pouring any concrete, the wall, windows and doors of your home should be covered to protect against concrete splashes and colour surface hardener or antique release agent powder being blown onto them. Plastic sheeting is normally used for this and it may be worthwhile considering whether your neighbours’ homes may benefit from the same protection. 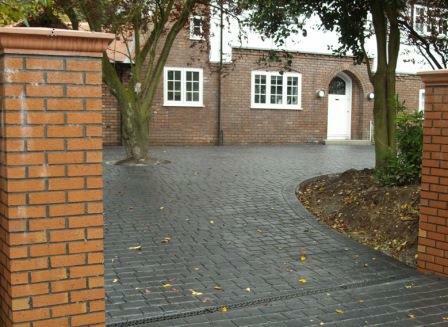 For pattern imprinted concrete driveways, only ready-mixed concrete from a QSRMS accredited supplier should be used. Prepared to the correct formulation it will satisfy the requirements of consistency, workability, strength and durability. The more cement in there is in concrete the stronger it will be and the more quickly it will set. Consequently, the time of year can affect the appropriate concrete formulation for a pattern imprinted concrete driveway, with more cement required in the mix during winter compared to summer. The concrete should also contain fibre reinforcement (to improve strength and impact resistance) and an air entraining agent which means that around 5% of the concrete by volume consists of tiny air bubbles. These bubbles are far too small to hold water but they allow concrete to expand into them which helps to reduce flaking of the concrete surface. Once the sub-base, formwork and edging is in place and the surrounding buildings have been protected, concrete can be poured. Most ready mixed concrete is delivered by trucks with a maximum capacity of six cubic metres. Because pattern imprinted concrete for a domestic driveway should be at least 100 mm thick, up to sixty square metres can be installed from one delivery. Concrete is normally unloaded into wheelbarrows but it could be pumped through a pipe directly from the delivery truck onto the new driveway area. From there it spread over the prepared sub-base using rakes. A screeding tool and a large spirit level is used to prepare the concrete to the required falls for drainage and it is then rolled with a roller bug to press the stone aggregate into the concrete slab and to even out the concrete surface. 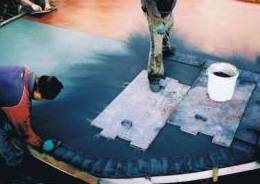 Before applying colour surface hardener, large magnesium floats are used to trowel the surface of the concrete. This will create a slightly wet, shiny, flat, familiarly grey concrete coloured slab which is now ready to accept colour surface hardener. 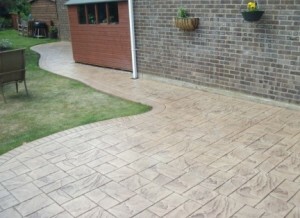 Colouring and printing pattern imprinted concrete is a fine balance between art and science but any minor imperfections in the finished driveway should be accepted in the same way that they would be for natural stone paving products. Colour Surface Hardener (CSH) is a mixture of powdered pigment to stain the concrete and cement to harden it and CSH can make pattern imprinted concrete almost twice as hard as ordinary concrete. 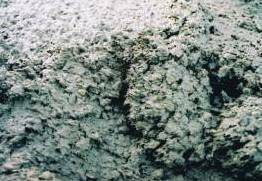 Colour Surface Hardener powder is cast over the surface of the concrete by hand where it is allowed to hydrate before being floated into it. 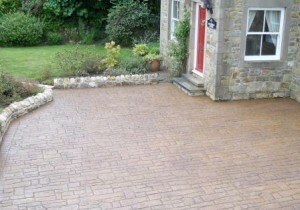 This is repeated several times until all surface water on the concrete has been absorbed and the colour is uniform. 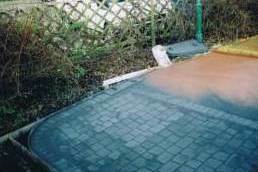 In terms of the overall cost of a pattern imprinted concrete driveway, colour surface hardener is not expensive but some installers will still use too little and end up with a poor, patchy finish. 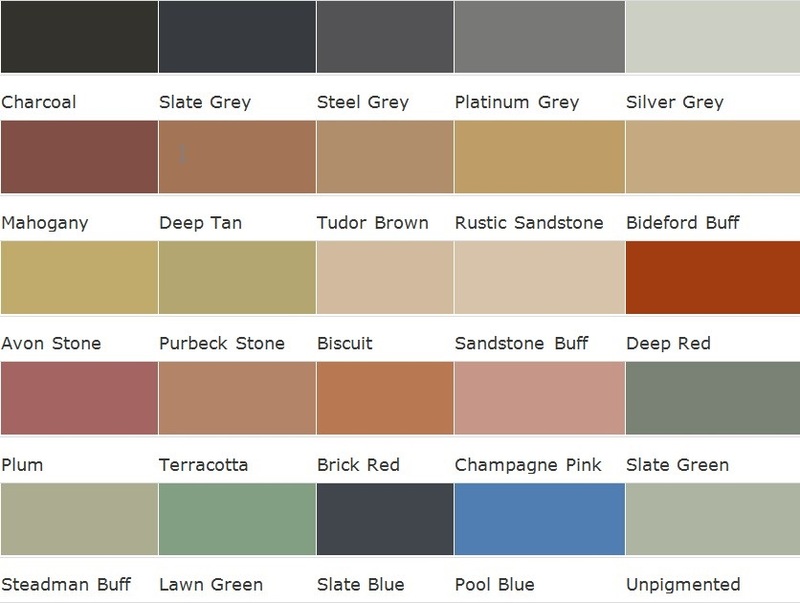 Approximately 2½ kilograms of colour surface hardener per square metre should be used for a uniform colour finish, although more is better in high use areas such as the driveway entrance and in front of a garage. Once the surface of the stained concrete is consistent and uniformly coloured, a large blue steel trowel up to a metre long is used to smooth and close the surface. Before applying antique release agent the surface of the concrete should be completely smooth and free of any trowel marks. Antique release agent is a pigmented powder which complements the colour of the colour surface hardener to provide a two-tone, antique effect to the finished pattern imprinted concrete surface. It also prevents the printing mats from sticking, due to the suction effect, to the still damp concrete. Antique release agent is applied over the coloured surface of the concrete with a soft, dry brush but it is not floated into the surface. Lifting the printing mats without the suction effect to spoil the print ensures a cleaner, sharper and better defined printed pattern for the finished surface. Also, without antique release agent to create a multi-coloured stone effect, the finished pattern imprinted concrete would be a single, solid colour, unlike natural paving products. When choosing the patterns and colours for your pattern imprinted concrete driveway or patio, the decision regarding which pattern, which colour surface hardener and which antique release agent to use should be a co-ordinated one. 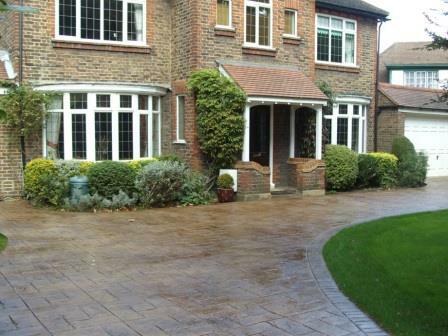 This will ensure that your finished driveway has a realistic appearance and that the pattern chosen does actually exist in nature, in the colours to be used. Once the antique release agent has been applied and before the concrete starts to harden too much, moulded printing mats are pressed into the concrete surface to create the desired pattern. Printing mats are available to replicate stone, cobble, slate, tiles, bricks and timber boards and generally come in sets of six or more. Hard printing mats are used for most of the surface with flexible ones used at the edges. Printing mats are laid onto the surface of the concrete in an interlocking row and the installer will stamp on them in turn to press them into the concrete surface. Hence the terms stamped concrete or pressed concrete. Once the concrete has hardened, excess antique release agent powder is removed and the surface washed off. If this is done too early, the surface of the concrete can be damaged. 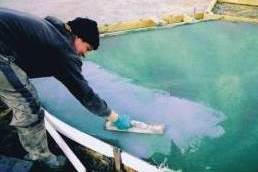 The powder is brushed from the patterned surface and then a release agent wash is applied to break it down so that it can be power washed from the surface. A mild acid wash is also used to ensure that all traces of antique release agent have been removed before the concrete sealant can be applied. If sealant is applied over antique release agent it will delaminate from the concrete surface to create a patchy appearance. There is no denying that concrete has a tendency to crack as it shrinks, because it is weak in tension. Some paving companies do deny this and don’t cut crack control joints because some homeowners don’t want cuts across their new driveway but this is the wrong thing to do. If you don’t want crack control joints across a pattern imprinted concrete driveway that needs them, you should choose some other type of paving such as block paving. Crack control joints in pattern imprinted concrete are also known as contraction joints because they deal with the contraction or shrinking of the concrete; they are not expansion joints as they are often incorrectly referred to. Crack control joints are cut partially through the concrete as soon as it has hardened so that if the concrete slab is going to crack, it will crack at its weakest point, that is, in the remainder of the solid concrete below the cut where it will not be seen. 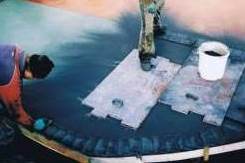 Contraction joints are cut with a diamond saw blade and they enable the installer to pre-determine the location of future cracking. Without crack control joints concrete could crack randomly across its surface which would spoil the appearance of your pattern imprinted concrete driveway. Restrict the size of concrete slabs to 20 square metres (for 100 mm thick concrete). Ensure that the length to width ratio of any slab is no greater than 2:1. Install steel reinforcement across any risk area, such as at the external corners of buildings. Use thicker concrete, especially if heavy vehicles will be using the area. In order to save time, some installers will cut crack control joints into the concrete before cleaning the antique release agent away. This is acceptable and means that the driveway only needs to be cleaned once. Where a contraction joint has to be cut across a driveway in a prominent position, it can be disguised by installing aco drainage across the line of the cut. This is useful on a long sloping driveway which would need several crack control joints and it also deals with excess surface water run-off. Once the concrete is completely dry, solvent-based microporous acrylic sealant is sprayed onto the surface of the pattern imprinted concrete in several thin coats. If there is a risk of rain, this should be delayed as water will prevent sealant from bonding to the surface of the concrete. Water-based sealants should not be used as they are not durable enough. Solvent-based acrylic sealants protect the surface of the pattern imprinted concrete from staining and help prevent colour surface hardener and antique release agent pigments from fading under the sun’s ultra violet light. Even with normal domestic use acrylic sealant will wear over time and will probably need replacing every three to five years to protect the pattern imprinted concrete surface. When first applied, sealant gives the pattern imprinted concrete surface a shiny, unnatural appearance but it will soon fade to a more realistic surface. To reduce weed growth in the saw cuts of crack control joints, they should be filled with a bead of silicone. This will also prevent small stones from settling in the gaps which, when a car drives over them could damage the edges of the concrete. Before leaving, the installer should check that all manhole covers lift freely and are not jammed by over spilled concrete and that all drains and drainage channels are free flowing. When installed properly in good weather conditions by a competent contractor, pattern imprinted concrete provides an attractive and durable paved surface for a domestic driveway or patio area. When installed badly it is almost impossible to patch or repair invisibly. Consequently, most of the potential problems that can arise with the installation of a pattern imprinted concrete driveway or patio are down to the competence of the installer. Pattern imprinted concrete provides the appearance of stone, cobbles, brick, slate, tile or timber boards at a fraction of the price of these natural paving products. With all of the different types of printing mat available and the vast number of colours and effects possible, pattern imprinted concrete offers a wide choice of finishes. 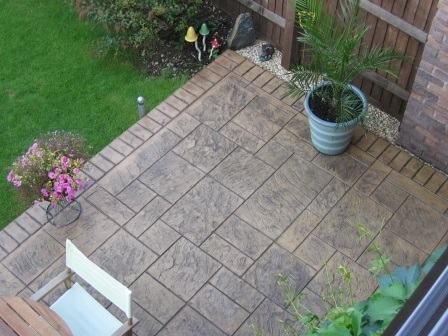 Pattern Imprinted concrete is a solid paving product which does not allow weed growth through. Pattern imprinted concrete can be installed far more quickly than stone cobbles or setts, which means less disruption. Other than resealing the concrete surface every few years pattern imprinted concrete is relatively maintenance free. 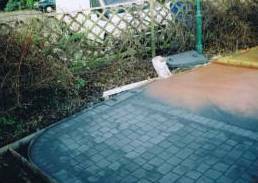 If a section of your pattern imprinted concrete driveway is badly printed or coloured or part of it is damaged, it is almost impossible to repair it without it looking different from the rest. Incorrect application of colour surface hardener, antique release agent or sealant can lead to early wearing of the concrete surface. 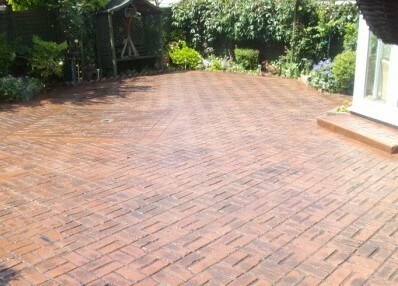 This can lead to flaking of the surface, early wear of the coloured layer and exposure of grey concrete. Failing to properly cut crack control joints into the concrete can lead to random cracking of the surface which will spoil the appearance of your driveway. Being a solid concrete slab, underground pipes and cables cannot be accessed without excavation of the concrete. Pattern imprinted concrete may replicate the appearance of natural paving products but how well it achieves that is down to your personal, subjective opinion. If you are happy to accept an interpretation of natural paving then pattern imprinted concrete will not disappoint but if you want a perfectly natural looking stone or cobble driveway, you may not be happy with pattern imprinted concrete. How Much Does Pattern Imprinted Concrete Cost? Pattern Imprinted Concrete is usually charged per square metre with prices ranging from around £50 per metre up to well over £100 per metre. However, most installation companies will have a minimum order value of £2,000 to £2,500. The basic costs of materials which go into a pattern imprinted concrete driveway such as ready mixed concrete, colouring agents and sealants are pretty much the same for the vast majority of installation companies. The cost of hiring mechanical diggers and skips for earth removal are also similar. It follows that the large differences in prices charged by companies installing pattern imprinted concrete can often be down to how much profit they want to make and whether or not they have to pay sales staff. Having said that, the companies which have the most experience, carry out the most proficient work, do not cut corners and consequently have the best reputations will not be the cheapest. A good quality pattern imprinted concrete driveway cannot compete with the low prices of a cheap block paved driveway but it should cost no more than a driveway where the best quality blocks are installed by a skilled block paver. As with all home improvement projects, you should obtain several quotations, in writing and ask to see examples of driveways completed by the contractor before you employ them. Creating a good quality print in concrete is dependent on a number of factors but because ready mixed concrete starts to set as soon as it is delivered the contractor only gets one chance. The print can be spoiled if too much concrete is delivered for the installer to cope with, if there aren’t enough skilled installers to deal with it or if they don’t have enough printing mats. Equally, the weather can play its part, too hot and the concrete can set too quickly and if it rains during printing the surface can be ruined. An experienced, competent pattern imprinted concrete installer will plan ahead and ensure that the chances of obtaining a good quality print are maximised. In hot weather this can be helped by having several smaller deliveries of concrete and ensuring that you have sufficient manpower. Your contractor should also have at least enough printing mats to span the driveway; or better still, to span it in two rows. Use enough colour surface hardener – Insufficient colour surface hardener will inevitably result in patchy and inconsistent colouring on the pattern imprinted concrete surface. Approximately 2½ kilograms of colour surface hardener per square metre should be used consistently across the surface. If a contractor is running out of CSH at the end of the job, the last section will be paler than the rest, which is a consequence of poor planning. On large areas which may need several deliveries of concrete it is likely that the mix will be slightly different from one delivery to the next. This means that they will be slightly different in original shade and consistency. The sufficient application of enough colour surface hardener will deal with this problem but use too little and the difference in the finished surface will be noticeable. Ensure that all the antique release agent is washed away – Leaving traces of antique release agent on the concrete will prevent the sealant from bonding properly to the surface. When it dries, the hardened sealant can become delaminated from the concrete and cause a patchy appearance. The only solution is to remove the sealant with an acid wash, clean and dry the surface and apply fresh sealant. Use the correct concrete formulation – The more cement there is in concrete the stronger it will be and when used for pattern imprinted concrete driveways should have at least 320 k/m³ in summer and up to 400 k/m³ in winter. Concrete should also contain fibre reinforcement for extra strength and impact resistance; and an air entraining agent to reduce flaking of the surface. 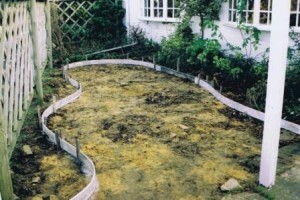 Ensure that the sub-base and concrete is thick enough – The sub-base should be at least 100 mm of Type 1 MOT and it must be properly compacted onto firm ground below; if the ground is soft, the contractor should dig deeper and install a thicker sub-base otherwise the concrete slab above could move, crack or sink. For most domestic driveways a 100 mm thickness of concrete should be adequate but if you expect vans or other commercial vehicles to use it, up to 200 mm may be required. Use enough colour surface hardener – Colour surface hardener hardens the surface of the concrete and improves its impact resistance. Using insufficient quantities of it will eventually allow damage to occur from freeze/thaw cycles and through constant vehicle usage. For long term durability, a pattern imprinted concrete driveway should have around 2.5 k/m² of colour surface hardener and more in high wear areas. Many of the factors which help achieve long term durability of a pattern imprinted concrete driveway will also help to minimise the chances of it cracking. Ensure the concrete is properly specified – The concrete should have a minimum of 320 k/m³ of cement and more in cold weather. It should have fibre reinforcement for durability and strength and an air entraining agent to help prevent the surface from flaking. Concrete should be correct thickness – In simple terms, regardless of the formulation, a thicker slab of concrete is less likely to crack than a thinner one. For most domestic driveways the concrete should be at least 100 mm, with up to 200 mm if vans are used on the driveway, whilst 75 mm should be adequate for pedestrian-only areas such as patios. Use a slip membrane if required – A slip membrane is a polythene sheet placed between the sub-base and the concrete allowing the concrete to move or ‘slip’ independently of any movement of the sub-base due to ground conditions. Because the concrete can move ever so slightly, it will reduce the build-up of stress in the slab which means that it is less likely to crack. Some contractors oppose the use of slip membranes on the basis that they prevent water from seeping from the concrete into the sub-base and the resulting excess water can spoil the print. 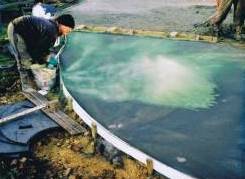 An experienced contractor will make a value judgement as regards the need for a slip membrane for each individual job. Position contraction joints correctly – Because concrete has a tendency to crack as it shrinks, cuts should be made partially through the concrete where it is most likely to crack anyway, otherwise the concrete may crack randomly across its surface. These cuts are referred to as crack control joints, movement joints or contraction joints; they are certainly not expansion joints as they often mistakenly called. Crack control joints are partial cuts through the concrete slab and become the weakest point so that any movement in the slab will cause the remainder to crack underneath the cut where it cannot be seen. Contractors may not be able to prevent concrete from cracking but in this way they can attempt to control where it does crack. Crack control joints should be cut in positions of high stress such as at the external corners of buildings; to reduce any slab size within the whole paved area to 20 m² and to ensure that any individual slab has a length to width ratio of no more than 2:1, which means that a one metre wide footpath should have a contraction joint every two metres. Don’t cut the contraction joints too late – Concrete can crack as it shrinks and it can shrink at a faster rate as it is drying out and hardening. It makes sense therefore to cut contraction joints as soon as possible to avoid the risk of the concrete cracking before it can be cut. Use solvent-based acrylic sealant – Solvent-based acrylic sealants should be used to seal the surface of the concrete rather than less effective water-based sealants. This is because problems are much easier to remedy if solvent-based sealants are used. Both types have to be applied when the concrete surface is completely dry. Pattern imprinted concrete should be rejuvenated every three to five years by removing the old sealant and applying new. This is relatively straightforward with solvent-based sealants but much more difficult with water-based sealants. Fill contraction joints with silicone – Crack control joints should be filled with a bead of silicone otherwise they can fill with debris and small stones. Weeds can develop in the cuts and driving over a joint full of small stones can cause damage to the edges of the concrete which would be very difficult to repair. Cleaning and sealing pattern imprinted concrete should be carried out every 3 to 5 years with a solvent-based acrylic sealant. Resin rich solvent-based acrylic sealant is a sacrificial layer designed to protect the coloured concrete surface below. As the layer of sealer starts to wear thin it will turn brittle and flaky, and the concrete will lose its colour and look dull. 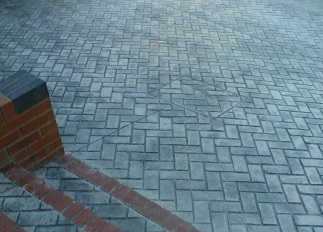 Before resealing pattern imprinted concrete, all of the old sealer must be removed with a mild acid wash. The acid should then be washed off with clear water and the surface allowed to dry completely before new sealer is applied. Cleaning and resealing pattern imprinted concrete is a relatively simple task as long as the original installation was carried out correctly.